The DJET1000 Air-Fuel Monitor Kit brings the accuracy, repeatability, and reliability of the AFM1000 Air-Fuel Ratio Monitor to Dynojet™ dynamometers. The DJET1000 Kit is a complete plug-n-playair-fuel ratio (AFR) measurement system that includes an external sampling system that draws exhaust from the tailpipe of a car,truck, motorcycle, snowmobile, or ATV through a flexible probe placed in the tailpipe. The probe is mounted on a stand that canbe easily adjusted to the vehicle's tailpipe height. A wide-range AFR sensor is located in the probe and measures the AFR. The AFR sensor is removable for optional mounting directly on the vehicle's exhaust system. A compact pump mounted at the probe's exitdraws exhaust through the probe and past the sensor. For long, trouble-free operation, the pump is powered by shop air and has nomoving parts. 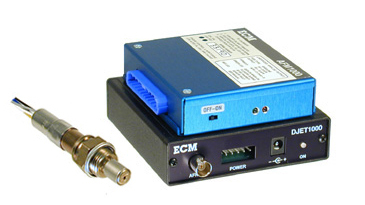 The AFM1000 module connects to the AFR sensor through a 20' cable and passes the AFR data to the DJET1000 adaptermodule that plugs directly into the Dynojet DynoWare™ stack. AFR data is displayed with RPM and horsepower in real-time. Plotting, storing, and recalling runs are the same, but now AFR data is included. The DJET1000 Air-Fuel Ratio Monitor Kit provides accurate, repeatable AFR data that integrates perfectly with Dynojettest results.